Location: Sambuca is located in the Rice Hotel building. Parking: Street metered and private parking are available options. Valet is available on Texas Avenue, in front of Azuma restaurant. The cost for valet is $12. It may be the most convenient option. For VISITORS: Sorry, we do not offer refunds to visitors or prospective members. You are welcome to send a substitute. A substitution charge of $15 applies. To register the substitute, use the registration category, "Substituting for a Visitor." On the next page of registration, indicate the name of the person whom you are substituting. FOR GENERAL MEMBERS: If you let us know at least 48 hours prior, we will credit your HSF account for the fees, so you can apply the fees toward a future event. 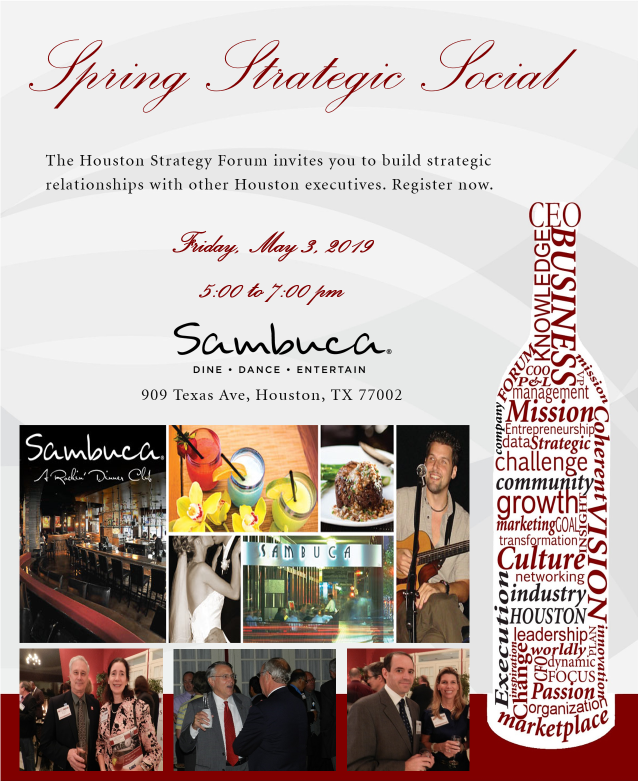 Houston Strategy Forum expects professional conduct from all attendees. HSF hosts Socials for the purpose of building meaningful, long-term relationships. Please feel free to engage in business development activities at the socials.